Like all blogs, this one is a dead vole. Here’s what I mean. My wife Rachel and I [Carl] have cats. They get to go outside and as a result, they bring us cargo in the form of various dead, nearly dead, or disturbingly-not-at-all-dead animals. Their favorite cargo is a small beastie that inhabits our yard. These are shrews, but because we prefer our references Monty Python rather than Shakespeare we call them voles. As a result of this attempted gift exchange we have developed what we call the “dead vole theory.” Anytime someone offers you something they clearly think is of great value but that you honestly find impertinent or distasteful, they are offering a ‘dead vole’. Dead voles may be recommendations of tv shows, music, food, reading material; they may be religions, philosophies, or political views; they may be pet theories or advice about how to live your life. The thing about the vole is that it’s just totally fabulous to them, it really is. But it’s not to you, and this creates a bind, because you want to accept this generous gift in the spirit of giving, but gosh dude, it’s a dead vole. Obviously if I really respected the mutual critter-ness of my cats I would yummy up the vole, crunch crunch tasty vole here, and slurp the tail appreciatively. Nah. When I reserve the right not to accept gifts of dead voles I am not in any way commenting on their or their givers’ value. Rock on with that, kitties. I am saying that this is not for me. If this blog is not for you, rock on with that. Go eat your own kind of vole in peace. Or go here. I originally posted this theory in much the same form on Savage Minds, which I recommend. 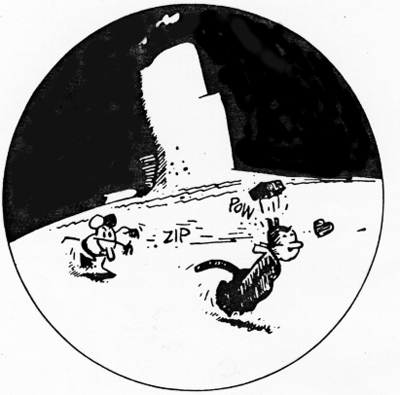 My gravatar is Ignatz from George Herriman’s “Krazy Kat.” Ignatz is a mouse, not a vole, but voles here are shrews not voles so it’s ok. In the perfect inversion of the dead vole concept, Ignatz throws bricks at Krazy’s head with intent to maim, and she/he receives them as delightful missives of love.